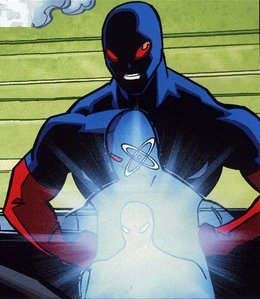 Powers: Micron can fly and alter the size of his body in various ways; to shrink to microscopic levels or grow taller than a skyscraper. His strength is also proportional to his size. Micron appeared in Season 3, Episode 7, of the DC Animated series Batman Beyond. He is a member of the Justice League Unlimited. He is injured attempting to stop a train. It is later found out that the accident was staged to injure him, and even later found out that the culprit was a mind-controlled Superman. He looks awesome, if D.C. hasn’t used him in print it’s their loss.